Dozier Memorials is a family owned and operated business that was founded by Mr. Gary Dozier in Fortson, GA, just north of Columbus, GA in 1980. In 1993, a second office was opened in Manchester, GA and soon thereafter became the base location for the business. Upon the arrival of his son, Gary Dozier, II, joining the business in 2003, The Dozier Agency was formed later in December 2005. Its function is to provide funding options to families who choose to plan ahead for their final arrangements. His daughter, Brandi Shay Dozier, joined the business in 2008 as Marketing Coordinator. Together we build on the legacy that Gary Dozier started over 36 years ago—memorializing the memories of your loved ones. We are the helping hand that ensures that your recollection of them remains intact through a memorial. We offer Granite, Bronze, & Marble memorials that comes in different styles (Individuals, Companions, Mausoleums), and designs to choose from. Accentuate your loved ones memorial by displaying photo etchings or emblems that tell who they were. All of this is readily available to you at Dozier Memorials. 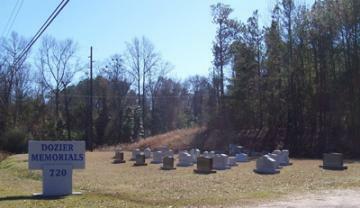 Dozier Memorials is Licensed, Insured, and Bonded. Dozier Memorials, LLC is a member of Monument Builders of North America as well as the Meriwether County Chamber of Commerce. After all, Your Life is a Story, let Dozier Memorials help you to Tell It Well. Visit our online store to browse styles, materials and more for your loved one's memorial!